From a CBS News – New York Times poll conducted April 5 – 10, 2010. Pay attention! This is the first mass movement in America since the early 1970’s. At the end are links to other articles and posts about the Tea Party movement. The good questions (and amazing answers) are below the fold. 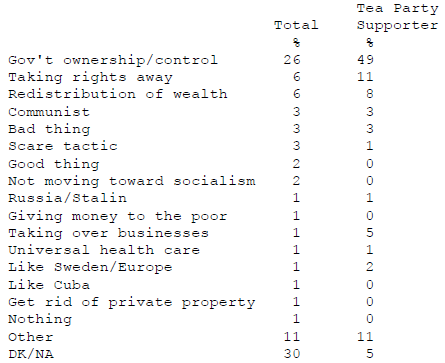 #89 — What do you think should be the MAIN goal of the Tea Party movement? #80 — Regardless of your overall opinion, do you think the views of the people involved in the Tea Party movement generally reflect the views of most Americans? #48 — Do you think of Barack Obama as more of a liberal, a moderate, or a conservative? #49 — Do you think Barack Obama’s policies are moving the country more toward socialism? #73 — When someone says the country is moving toward socialism, what does that mean to you? #50 — According to the Constitution, American Presidents must be “natural born citizens.” Some people say Barack Obama was NOT born in the United States, but was born in another country. Do YOU think Barack Obama was born in the United States? See the March 8 post for links to older articles. “Tea Partiers Are Fairly Mainstream in Their Demographics“, Gallup, 5 April 2010 — Sad but true. They want lots of government action to benefit them, but don’t want to pay for it.